Winner Ricky Weiss poses with oxen in victory lane. What won the race: Inheriting the lead after grueling demises for leaders Bobby Pierce and then Scott Bloomquist, Ricky Weiss of Headingley, Manitoba, led the final two laps at FK Rod Ends Arizona Speedway to capture the $14,000 Keyser Manufacturing Wild West Shootout finale. Key notes: Bobby Pierce earned $10,000 from the Keyser Quarter-Million Challenge for his three victories, all in the first three races. ... Ricky Weiss won two miniseries races for the second straight season. ... The event drew 54 Late Model drivers over six events. On the move: Winner Ricky Weiss started 11th; third-finishing Brandon Sheppard of New Berlin, Ill., started 15th. Winner's sponsors: Weiss drives a Sweet-Bloomquist car powered by a Vic Hill Racing Engine and sponsored by Derrick's Sandblasting, AIE Communications, Hawkeye Construction, Penske Racing Shocks, Allied Roofing, Orthopaedic Institute of Western Kentucky, Keewatin Truck Service, Turk Enterprises, Forest Flying Service and Straight Ahead Ventures. Points chase: Brandon Sheppard had 361 points to win the miniseries title over Bobby Pierce (341). QUEEN CREEK, Ariz. — When calamity befell two leaders — one on the final lap — Ricky Weiss unexpectedly found himself in FK Rod Ends Arizona Speedway victory lane with a $14,000 victory in the Keyser Manufacturing Wild West Shootout’s Sunday finale. The 11th-starting Weiss led the final two laps of the Shaw Trucking 50 after his mentor and chassis builder Scott Bloomquist was collected in a last-lap wreck in turn three and after three-race winner Bobby Pierce exited with rear-end problems while leading just past halfway. The week’s second victory for the driver from Headingley, Manitoba, proved to be a wild ending to the Wild West week, leaving the Canadian with mixed emotions in victory lane. “I hate to see that for Scott. He was checked out. He was gone,” Weiss said. “I mean, I just can’t thank those guys enough … I feel heartbroken for him and (Bloomquist crew chief) Cody (Mallory) and they’d been working hard and had so much bad luck this week, and our speed is thanks to them. Restarting out front after Bloomquist’s demise, Weiss won the two-lap shootout over runner-up Brandon Overton of Evans, Ga., by 1.109 seconds to record his fourth career miniseries victory, all during the past two seasons. Brandon Sheppard of New Berlin, Ill., rallied from 15th to third to wrest the $3,000 miniseries title from Pierce while Chase Junghans of Manhattan, Kan., and Jimmy Mars of Menomonie, Wis., rounded out the top five at the third-mile desert oval. What was shaping up to be a Pierce-Bloomquist showdown through the first half of the race evaporated when the pole-starting Pierce suddenly slowed on the frontstretch after leading 26 of the first 27 laps, dropping to the infield with fluid coming from the rear end. Pierce, who won the first three miniseries races, had the most to lose while chasing a $25,000 bonus from the Keyser Quarter-Million Challenge with a fourth victory. His departure left Pierce to settle for the $10,000 bonus he’ll receive for winning half the races. With Pierce out of the race, Bloomquist took control with Weiss giving chase, and Bloomquist stretched his lead to 3.5 seconds in the race’s waning laps as he cruised far ahead of the field. But after taking the white flag, Bloomquist found disaster in turn three when R.C. Whitwell’s spun car sat against the wall, leaving Bloomquist nowhere to go. His car suffered heavy right-side damage as he spun to a stop in the middle of the track with Pat Doar’s car sliding into the fray. Bloomquist said the “the dark wall, the dark car, the circumstances” prevented him from being able to avoid striking Whitwell’s machine. With Bloomquist’s damaged machine restarting on the tail of the lead lap, Weiss held off Overton and Sheppard for his second miniseries victory in as many days. He was wary of the final restart. “I seen Overton come on the outside there, I knew he’d whale that cushion," Weiss said. "It was a little treacherous up there. Later in the race actually, when Scott was kind of pulling away, I was just kind of moving around and feeling it out, and I seemed to get better as I could kind of cut down that corner. Overton’s runner-up finish marked his third top-five of the tour and gave him a third-place finish in miniseries points behind Sheppard and Pierce. Sheppard, who never finished no worse than fifth in six races, felt his car was as good as it was all week in advancing a dozen positions to secure third and the miniseries title. “We stayed in the top-five all week and that’s pretty cool," Sheppard said. "Obviously we’d like to get a win, but we had a lot of bad luck this week that nobody seen. On the test day we broke a lift bar and tore everything up, and we had to change a (transmission) today, and it was just one thing after another. Hat’s off to my crew. Besides the late caution for Bloomquist’s wreck, the 50-lapper was slowed by three yellow flags, first on the ninth lap when Joey Moriarty’s car got hung up on the turn-one wall at the track exit, again on the 12th lap when Stormy Scott got into the turn-three concrete and finally when Pierce slowed on lap 27. Notes: Officials announced at the drivers’ meeting that 2020’s miniseries race dates were Jan. 11-12, 15 and 17-19 with a Jan. 10 practice. Next season’s finale will pay a miniseries-high $15,000-to-win for Super Late Models. … Jason Papich of Nipomo, Calif., and Blair Nothdurft of Sioux City, S.D., finished in the top two spots in the Pro Power Dash for non-qualifiers; Papich elected to start the 50-lapper while Nothdurft took the $1,000 in earnings. … Justin Duty of Mulino, Ore., who skipped Saturday night’s event to make an engine swap, got into the backstretch wall during time trials and scratched for the night. … Ricky Thornton Jr. captured the USRA modified finale to become the division’s only repeat winner; Darrell Nelson won the division’s points title. … Cole Searing won the caution-free X-mod main event, wrapping up the division’s miniseries points title with his fourth victory. Finish: Jason Papich, Blair Nothdurft, Rece Vaught, Xavier Ortega, Rob Mayea, Steve Stultz. First consolation (top four transfer): Stormy Scott, Don Shaw, Terry Phillips, Joey Tanner, Jason Papich, John Cornell, Blair Nothdurft, Brad Williams, Xavier Ortega, Richard Wallace, Dennis Souza, Rob Sanders. Second consolation (top four transfer): Joey Moriarty, Tony Toste, Billy Franklin, Cole Schill, Rece Vaught, Rob Mayea, Steve Stultz, Terry Carter. Scratched: Justin Duty, Kolby Vandenbergh, Steve Isenberg. Jimmy Mars led all the way from the pole while R.C. Whitwell wrested the second spot away from Chris Simpson early in the eight-lapper. Simpson settled for third while Garrett Alberson won a tight battle with Billy Franklin for the final transfer spot. Franklin spun in turn two on the first attempted start after getting in too hot under Alberson. Finish (top four transfer): Jimmy Mars, R.C. Whitwell, Chris Simpson, Garrett Alberson, Billy Franklin, Rece Vaught, Steve Isenberg, Terry Carter. Chase Junghans raced to victory from outside the front row, taking the checkers ahead of polesitter Pat Doar. Ricky Weiss moved up to second early before Doar's second-lap slide job dropped him back to third, and he transferred along with fourth-finishing Brandon Sheppard. Stormy Scott inched ahead of Sheppard on the second lap but settled for fifth and heads for a consolation race. Finish (top four transfer): Chase Junghans, Pat Doar, Ricky Weiss, Brandon Sheppard, Stormy Scott, Terry Phillips, Blair Nothdurft, John Cornell, Brad Williams, Xavier Ortega. In a battle royale of a Scott Bloomquist-Bobby Pierce front row, Pierce got the jump on the outside and raced to victory. Bloomquist nearly lost the second spot to Earl Pearson Jr., before settling into second while Pearson and Kyle Beard got the other transfer spots. The race went caution-free as Pierce moved a step closer to a possible $25,000 bonus for four miniseries feature victories. Finish (top four transfer): Bobby Pierce, Scott Bloomquist, Earl Pearson Jr., Kyle Beard, Joey Moriarty, Tony Toste, Cole Schill, Rob Mayea, Steve Stultz. Scratched: Justin Duty. Polesitter Cade Dillard washed up in turn two on an early restart, giving up the lead to Brandon Overton, who raced to an eight-lap victory. Dillard settled for second while Cody Laney was third after front-row starter Hudson O'Neal also struggled on the early restart. Dennis Souza spun for a second-lap caution. Finish (top four transfer): Brandon Overton, Cade Dillard, Cody Laney, Hudson O'Neal, Jason Papich, Don Shaw, Joey Tanner, Rob Sanders, Richard Wallace, Dennis Souza. The Keyser Manufacturing Wild West Shootout wraps up Sunday with a 50-lap Super Late Model finale paying $14,000-to-win at the third-mile FK Rod Ends Arizona Speedway oval. Not only the is event’s richest purse on the line — every starter earns at least $1,000 — but Bobby Pierce of Oakwood, Ill., can earn a $25,000 bonus from the Keyser Quarter-Million Challenge if he can capture his fourth miniseries victory. Pierce won the first three miniseries races while Ricky Weiss of Headingley, Manitoba, and Cade Dillard of Robeline, La., split Saturday’s doubleheader with $5,000 victories. Sunday’s hot laps are scheduled for 3 p.m. (moved up a half-hour to make room for Saturday's postponed USRA modified feature). 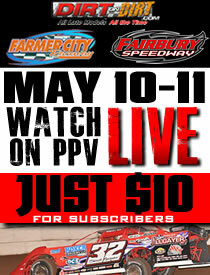 Modifieds and X-mods are on the undercard of the Super Late Model program. Late Model entries will be split into four groups for time trials with officials employing combination hot-lap/time trials to set the lineups for four heat races. Drivers start straightup by time. The top four finishers in each of four heat races transfer to the $1,000-to-start main event with the winners redrawing for the first two rows of the feature lineup. Two consolation races will transfer four drivers apiece to the 24-car field for the main event.